4. Check out how the Guest Journal Strategy works here. Incredibots is a "physics playground" designed for creating two dimensional(2D) robots. This flash-based web app allows you to create 2D robots, games (challenges), and play an expansive user-created library of bots. This year I began teaching a robot building unit in my technology classes using Incredibots 2. Students were hooked right from the start, because many of them already had a love for physics games. Not only was the unit super engaging, but also it covered several of the national technology standards NETS, with a strong focus on creativity and problem solving skills. This post is an outline of how I taught this unit, broken down for you in 4 nice 'n tidy steps. 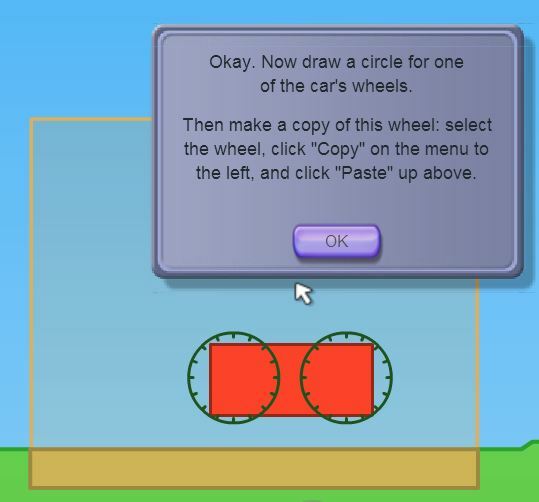 Incredibots includes 10 step-by-step tutorials designed to teach you how to use the main tools in the physics engine. The key to these tutorials is making sure students read the directions carefully. 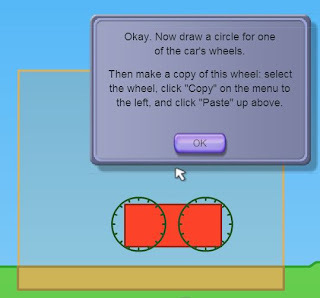 After completing all 10 tutorials, students should be able to have all the understanding they need to develop their own basic robots using in the sandbox mode. Tutorial 10 was the most difficult for my students to complete, but is a necessary tutorial if you plan to have your students create challenges. The next step is writing robot plans. This gets students thinking about what tasks they hope their robot will accomplish and how they will build thier robot. I've found that writing a plan gives students a stronger sense of purpose once they begin experimenting with the physics sandbox. Once students have submitted their plans to me, they begin building their robots in the Incredibots sandbox editor. As they build they are partnered up to share ideas and solutions to the problems they encounter. Oftentimes I will feature or demo student robots to the class to discuss these in a whole group. Below are examples of a few of the robots created by my students. The ATV bot is able to lift objects and dump them into a cargo tank. It can also drive forward and reverse and control a cannon. 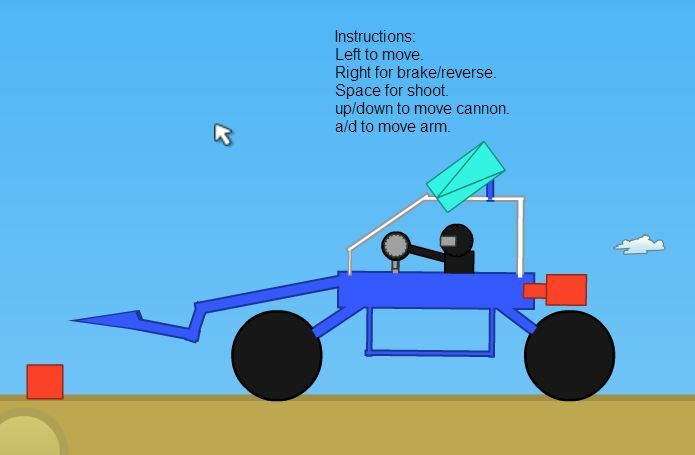 Cannons and thrusters are extra features that are not included in the tutorials, but students' will quickly discover many uses for these if given a chance to experiment with them. Load this as a challenge. One of my more advanced students created this robot. After students had finished creating their robots, I asked them to create challenges. Challenges are basically robots with win/loss conditions. In this challenge the game ends when the first robot is knocked over. There are also a ton more example robots that you can test out on the incredibots featured robots page. Creating 2D robots is one of the most engaging technology projects that I have ever taught. Things get really exciting when students get the chance to test their classmates' robots. 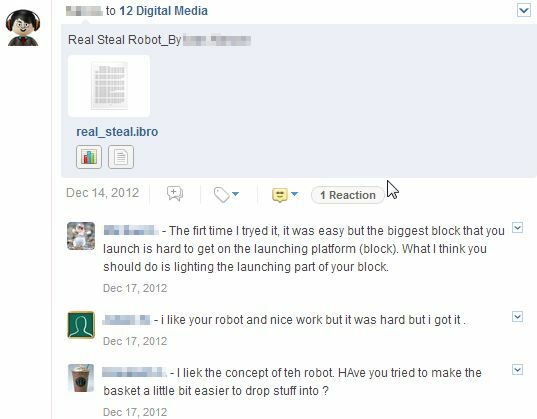 To do this, students post their robots on edmodo. This allows them to share their robot file that can be loaded in incredibots. After testing each robot, students are asked to give encouraging feedback and thoughtful suggestions to their peers. I hope you enjoy teaching this unit as much as I did. Thank you Incredibots! Standards: NETS: Creativity and Innovation, Critical Thinking, Problem Solving, Communication and CollaborationCCSS.ELA.2 : Write informative/explanatory texts to examine a topic and convey ideas, concepts, and information through the selection, organization, and analysis of relevant content. I came across this really neat video infographic about the fears and excitements of growing up. The video inspired a writing lesson in which I asked my students write a letter to themselves, ten years in the future. One of the current skills we are working on in reading is making predictions, so it fit right in. I started the lesson by students showing, "Growing Up" by the Infographics show. During the video I asked students to list examples of fears and excitements about growing up mentioned in the video. After discussing the video, I shared with the class a letter I wrote to myself 10 years in the future. I can’t even imagine how the world has changed in ten years, and maybe you have changed a little too. Oh, if you haven’t figured this out yet, I’m you, Ben Dalgas, at 29 years old. Speaking of, where are you in the world? Are you living in your much loved city of Salem or have you traveled on to new parts? Perhaps you have a new home in Mexico, Guatemala or somewhere new… Indonesia? Okay, so let me get to what is really on my heart, I want to know if your love has grown. Do you love Amy, Neli, Flora, your students, neighbors, family and world more than I do? Has your love grown for others? I wonder what challenges you have faced. This year when Flora was in the hospital my faith and love was deepened. The experience of our smallest child suffering was so challenging. It brought us to tears, our knees, and prayers of gratefulness. What losses have you grieved? Is your love stronger now? So, whew, that was kinda tough to get through, but I kinda wonder, what is Neli like now that she is 13? Does she have all the qualities of Amy? Caring, loving, empathetic. It is not too difficult for me to imagine because most things I learn these days are from 11 and 12-year-olds. Let me tell you, these students are true, real and gaining wisdom each day. What I love is to see their friendships grow. I wonder are these students still friends today? I hope so. Do their lives still connect and are they still sharing stories? Do you still hear from them? If you have the courage to ask, ask them something I wonder each day… is what I’m teaching them today, making a difference in their life? Was our class meaningful and important to them? I’m sorry if I’m so full of questions for you… It’s truly just hard not to ask. I know that I probably will not hear from you, but that’s okay, I’m just excited some day to be you. Thanks, for taking a moment to listen to a younger you. Finally, I asked students to write a letter to themselves, 10 years in the future. I gave them something similar to the prompt below as a starting point. Fears you have about growing up. Experiences you are looking forward to. Questions you have for your future self. I really enjoyed this activity because it allowed us to write about what really matters in life, without seeming superficial. Some of my favorite lines from students were, "Am I still daddy's little girl?" and "Does dad still dance in the kitchen like he always did?" I hope this writing activity is as fruitful for your class as it was for ours. Enjoy. One of the most practical and valuable tools in life is a good notebook or journal. A pocket journal is an ideal option for this, but these handy notepads cost the same and sometimes more than a standard size 100 page composition book. However, with cardboard, paper, yarn (or twine) and a few basic tools you can create a pretty decent pocket journal. Watch my video tutorial below to learn how. Last year I began the year using Prezi a free zoomable presentation online software, to present classroom routines. Since then, Prezi has improved and added features to the software. A few of these features are new templates that help you get started with creating a presentation as well as a simple tutorial. They've also added the ability to save your Prezi as a .pdf and make copies of other prezis you like amongst the shared library. This opens up the opportunity to easily use others presentations as a template for your own. So, with all these improvements, I felt that I should make some improvements to my own prezi's. Finally, here's one I created to introduce a new class I will be teaching this year: Digital Media Literacy. If you have a google account you can use your account to create forms for students to complete as a way to gather information, do formative assessments, practice a skill, or evaluate the class. I used google forms throughout the year last year for all of these purposes. This year I think I will begin the year using a reading survey in order to gather information about my students as readers. If you are interested, feel free to use the template below. Blackout Poetry is a form of poetry that begins with the newspaper and a marker as inspiration. Through selecting words and thoughts from an article and blacking out what remains, a poem is created. This technique for writing poetry could be used as an extension to articles read and discussed in class, a tool for teaching word choice, as a strategy for teaching free verse poetry, or an activity in identifying key words. Below you will find a few resources related to blackout poetry. Newspaper Blackout: A website dedicated to Blackout Poetry that allows anyone to contribute their poems. Austin Kleon: Author of the book "Newspaper Blackout."